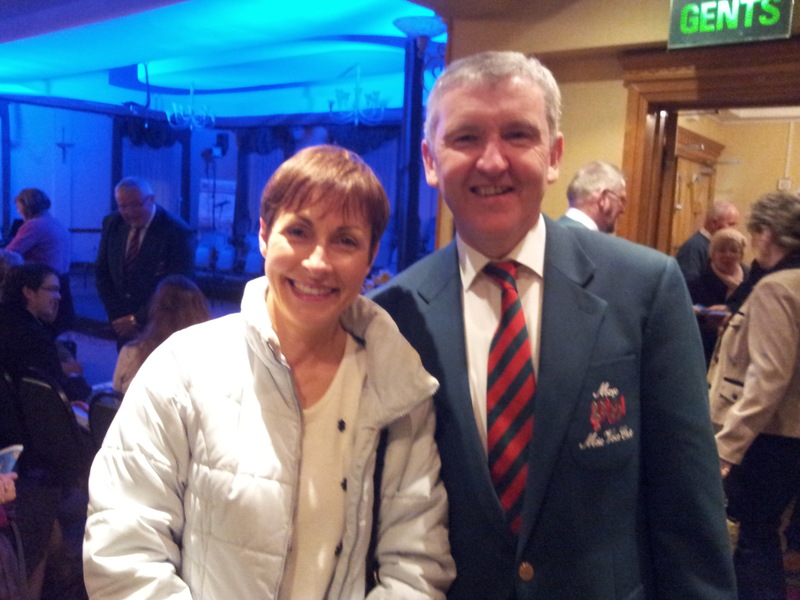 Mary Galvin and Adrian Keena before the concert. By 6.30 pm the buzz in the Fáilte Suite was palpable. With Gary's bright lights illuminating the stage, Mary O'Sullivan, super soprano from Dublin, and our good friend, David Durham, baritone, were going through their warm up with Deirdre Lee, MMVC choir director. Deirdre then took the choir through their paces before the men exited the hall and the final touches were put in place in readiness for the start of the show. Choir members currently on sabbatical leave (you can never fully leave MMVC! ), Seán Mullahy, Gary Bracken and Seán Hayes dutifully manned the door and guided people to their seats while Jimmy Murphy, MMVC treasurer, was assigned to ticket sales and pre-paid ticket collection. Pat McHale and Tony Conway bedecked the stage area with daffodils, to remind all present that it was Daffodil Day and that Spring had sprung! 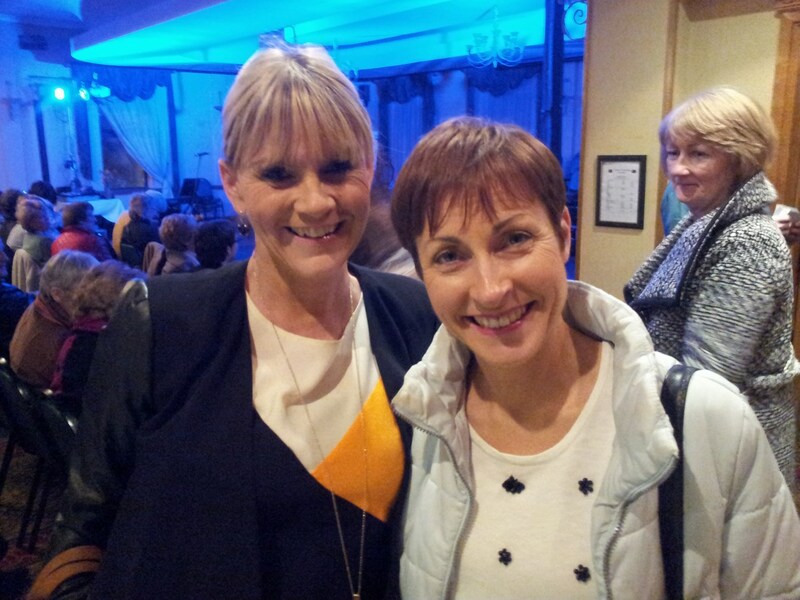 The good people of Castlebar and surrounding areas streamed in and before long there was only standing room remaining. Tommy Marren, of Mid-West Radio fame, again MC'd on the night and got proceedings under way, in his own inimitable style, by introducing Deirdre Lee and our accompanist on the night, Joseph Garvey. Joseph was asked to take over the role of accompanist only a month before the concert and had worked really hard to learn all the songs for the night's performance. His love of music and his sense of fun during rehearsals helped greatly in bringing some levity when the pressure was on! The choir took up their positions and proceeded to sing the opening numbers "Stout Hearted Men" followed by the beautiful "Anthem" from the musical Chess. The night had begun! Joseph Garvey, accompanist on the night, a picture in concentration! Soprano, Mary O'Sullivan, was introduced to the audience. Many had heard her sing with MMVC last year and had expressed their wish that she be invited back again this year. Her beautiful soprano voice and her ability to hit the high notes was exemplified in her first two numbers "Poor Wand'ring One" and "Quando M'en Vol Soletta" from La Boheme. Other highlights from the first half were "Ol Man River" by David Durham and "Strangers in Paradise" by Mary and David together. MMVC completed the first half with two competition pieces "Carrickfergus" with an incredible arrangement by Gwyn Arch and "What shall we do with the Drunken Sailor" both of which were very warmly received by the very appreciative audience. Declan Durcan, second tenor and Mayo Choral Festival director. During the interval there was the compulsory raffle. A lot of time and thought was put into the raffle this year by the committee especially on the prizes. Generous sponsorship by Sam Adams Restaurant, Breaffy House Hotel, Ballintubber Stores, Dunnes Stores and Murphy's Centra, Ballinrobe made for very desirable prizes ranging in value from 100 down to 20 euro. Ticket sales were brisk but before long it was time for sales to end and part two of the concert to commence. "The Mary G's" Mary Grealis and Mary Galvin arrive for the concert. Highlights from part two included "Down by the Riverside" with a solo by Steven Brady, "Summertime" by Mary O'Sullivan, "Les Chemin de l'Amour" by David Durham and "Isle of Hope" sung by MMVC with a solo by James Garvey. Special mention has to be made of Blade4, a barbershop quartet composed of four choir members, James Garvey, Joseph Garvey, Colin Kneafsey and David Loring. They sang "As Time Goes By" in beautiful harmony and received sustained applause at the end. As the night's proceedings drew to a close, Tommy Marren called on chairman Tony McNulty. Tony made an excellent speech, complimenting Joseph on taking over at the keyboard at short notice and Deirdre, our director, for her incredible talent and focus enabling her to conduct the choir one minute and accompany the soloists the next. Flower presentations were made to Deirdre and Mary. The final song, the brilliant Liverpool FC anthem "You'll Never Walk Alone" sung by the soloists and the choir together brought the audience to their feet. An encore and the raffle draw brought a very satisfying evening to a close. Deirdre Lee directing and Mary O'Sullivan leading MMVC in You'll Never Walk Alone. Many choir members have commented since that they have had numerous people coming up to them to tell them how much they enjoyed the show. This makes all the effort worthwhile for the members. The next performance by MMVC will be in Dunmore Community School at the Dunmore Choral Festival on Saturday May 16th followed by participation in the Male Voice Choir section of Mayo International Choral Festival on Saturday May 23rd in GMIT. Further details and many, many more photos are available on their website: www.mayomalevoicechoir.org. 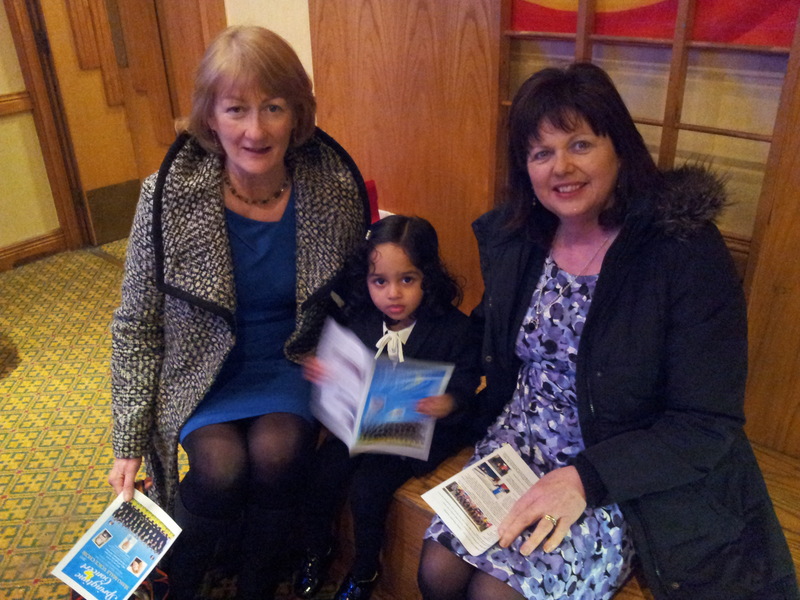 Marian Gilmartin and Nuala McGowan with MMVC's youngest supporter, Minashki Balakrishnan!